Although stainless steel is not a common material found around the home. It does happen that the home handyman can be faced with cutting and/or drilling stainless steel material. The following tips will help you to cut and drill stainless steel efficiently. 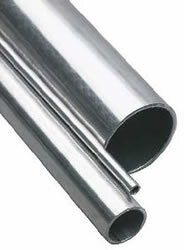 Selection of stainless steel tubing . Selection of stainless steel sheets . Selection of stainless steel bars and rods . Stainless Steel is a common name for metal alloy consisting of 10.5% or more Chromium (Cr). Stainless steel may also have varying amounts of Nickel, Molybdenum, Titanium, Niobium and other elements which resist corrosion and maintain strength at high temperatures. Since stainless steel is non-corrosive it is an excellent material for applications where severe environmental conditions exist including sinks and hospital equipment and is used vastly in the petrol chemical industries where repeated exposure to elements would otherwise be damaging to steel. Stainless has no negative impact on critical environments; whereas carbon steels introduce particulate and iron contaminations. Since stainless steel is harder to machine, cut and drill, greater force is required during the cutting process. When cutting or drilling stainless steel, maximum tool life can be achieved when the strokes of the machine or the revolutions per minute (rpm) are reduced to 1/3rd the maximum speed. Stainless steel also requires a moderate amount of pressure applied to the cutting tool. The addition of a cutting fluid will further reduce friction and heat and extend the life of your cutting tools. Always remember, faster is not better when cutting stainless steel. When full speed is used, the heat generated from the friction of the teeth penetrating the stainless steel will affect the hardness of the blade, causing premature tooth failure. Figure 2 - Using a hacksaw to cut a stainless steel rod. 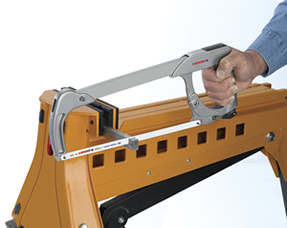 Your cutting tools are a valuable investment, protect your investment, and run them slower on hard materials. We wish to thank the LENOX Company for their assistance in writing this article.